This is a guest post on the MommyPotamus site by Aubrey of Homegrown & Healthy. 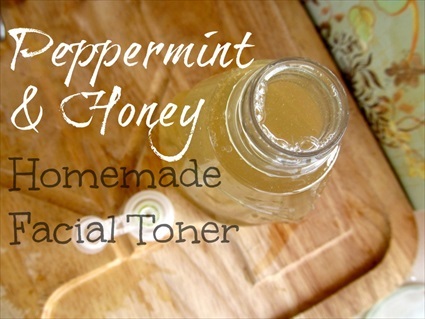 She shares her recipe for a Peppermint and Honey facial toner. Aubrey recommends using a particular type of honey. She also explains why honey is the perfect ingredient in a facial toner. She uses Peppermint because it’s is great for any type of skin. It hydrates when needed and improves the condition of oily skin if that’s what’s needed. So if you have combination skin (dry and oily), peppermint is an ideal ingredient. Finally Aubrey includes another ingredient that softens the skin, restores the skin’s natural pH balance and reduces blemishes. This is a toner you can use throughout the day to refresh your skin or you can apply it after your usual facial cleaner. Aubrey has a Peppermint and Lemon Face Wash that is wonderful when paired with the toner.